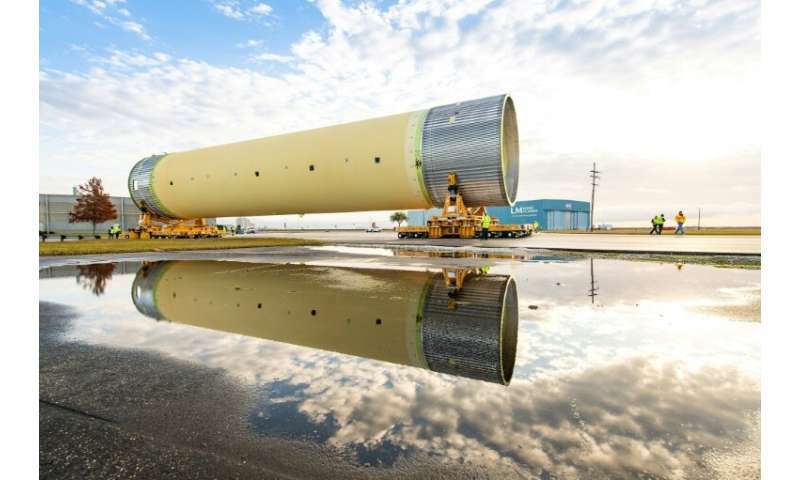 The US space agency NASA on Wednesday cast a shadow on the future of its new heavy-lift rocket, the SLS—acknowledging development delays on a project that is already years behind. The Space Launch System program is being run much as the Apollo and space shuttle mission were handled in the days of old. But Wednesday's announcement illustrates how quickly NASA has embraced a new era dominated by private space companies who are offering the option of low-cost transport on a mission-by-mission basis. 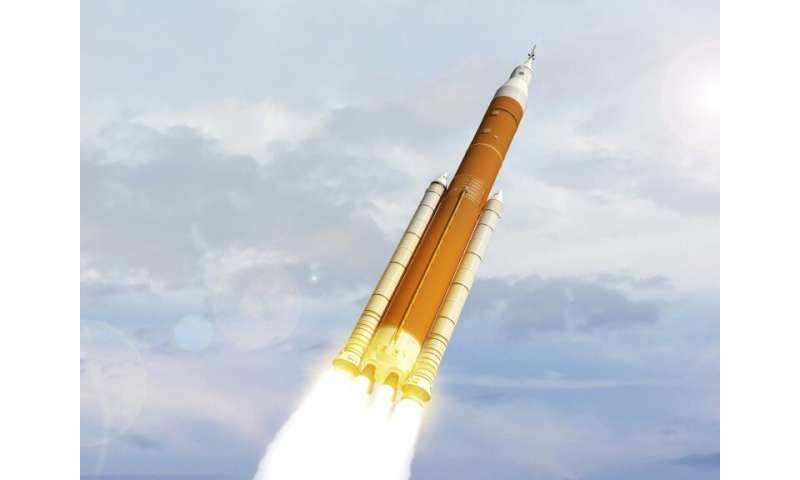 "SLS is struggling to meet its schedule" and won't be ready in time for a first unmanned mission around the Moon and back, dubbed EM-1, set for June 2020, NASA administrator Jim Bridenstine told lawmakers. "Last week, it came to our attention that we're not going to be able to maintain the schedule," which is already three years behind, he told the Senate Commerce, Science and Transportation Committee. Boeing has spent years developing the SLS, which would be the most powerful rocket ever built, with the goal of resuming manned space missions to the Moon. The project has already cost $12 billion. A capsule for astronauts, Orion, is being built by Lockheed-Martin and Europe for the missions. Wednesday marked the first time that NASA has clearly acknowledged the extent of the problems with the SLS. 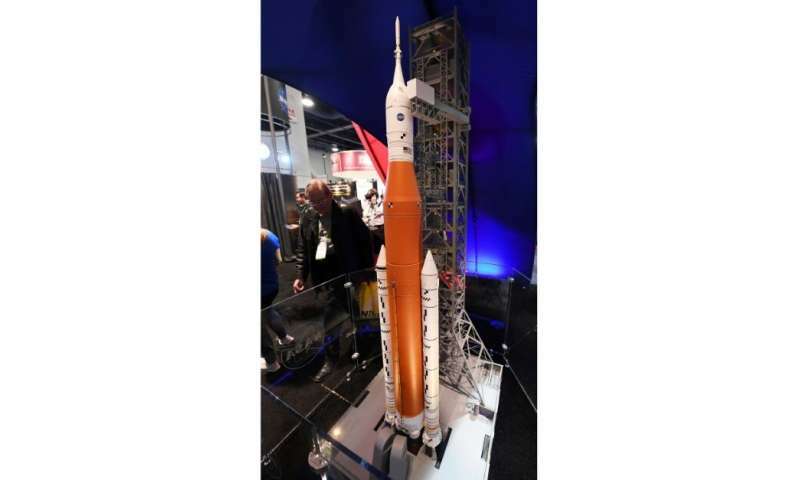 That news did not surprise industry analysts, who have signaled problems with the development of the SLS for years. Boeing is using more than 1,000 subcontractors in 43 US states to get the job done. That translates to thousands and thousands of jobs. Congress initially wanted a first flight in late 2016. NASA then pushed back the date little by little. But Bridenstine then made the shocking announcement that he wants to entrust the EM-1 mission to existing private launch systems, instead of waiting for SLS to be ready. "We have amazing capability that exists right now that we can use off the shelf in order to accomplish this objective," he said. He did not specify which private company he had in mind, but SpaceX—founded by billionaire Elon Musk—would be a natural candidate with its Falcon Heavy rocket. The Delta IV Heavy of United Launch Alliance—a joint venture of Lockheed and Boeing—also would be a capable alternative. The new plan would consist of launching the Orion capsule, and then following it up with the launch of an upper stage for propulsion. The two elements would then dock in orbit for the voyage around the Moon. No rocket in existence today is capable of lifting both elements together, because of their weight, which is why NASA had said it needed the more powerful SLS. "I want to be clear, we do not have right now an ability to dock the Orion crew capsule with anything in orbit. So between now and June of 2020, we would have to make that a reality," Bridenstine said. 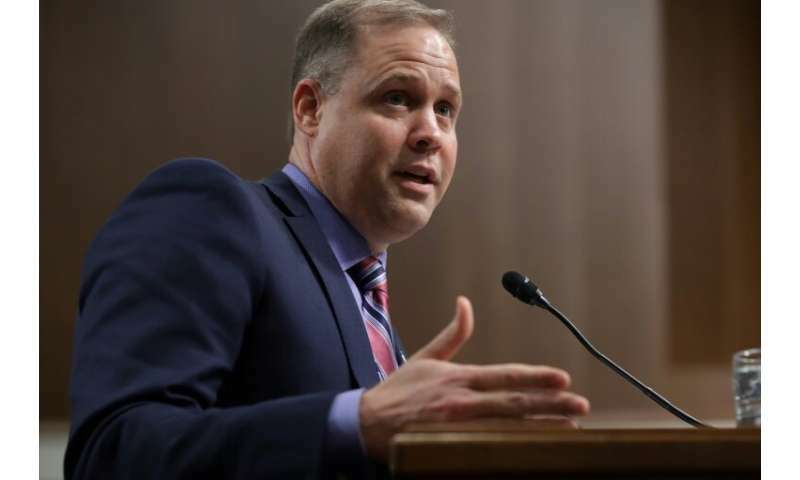 One skeptical senator reminded him: "This is 2019...."
Bridenstine replied: "NASA has a history of not meeting launch dates, and I'm trying to change that." The administration of President Donald Trump has made it clear that it is unhappy with all the delays. In its budget proposal unveiled on Monday, the government wants to let the private sector launch the components of the mini-space station, dubbed the Gateway, that NASA wants to put in orbit around the Moon in the 2020s. It also decided that private companies would launch a probe towards Jupiter's moon Europa. Both of those missions were initially expected to be carried out using the SLS. In the end, Congress will have to decide whether to pass the space budget as is or request changes that would preserve the SLS program's place in upcoming missions. Producing the SLS in 43 states means 86 senators have something to lose if the SLS program goes south, leading some snarky commentators to label it the "Senate Launch System." The budget for 2020 should be adopted in the coming months. This is welcome good news. It is sad how SLS and Orion have set back NASA's manned space program. Maybe the Senate will let go of SLS when they realize SLS is going to look particularly bad when SpaceX sends a bunch of tourists around the moon for chump change while SLS and Orion are still wasting tens of billions of dollars pretending to develop old single-use technology. By analogy, SLS is a coal burning sedan in development that costs 100 times as much as a new Tesla Model 3 available now. The way I see it, there is no way we will reach Mars in the 2030s doing business as usual. NASA has hinted at this by noting that SLS/Orion is soaking up so much money that the funds don't exist to develop the rest of the necessary infrastructure. The only way I can see it being possible is a tight NASA-SpaceX alliance, and even then, it will be very difficult. Fingers crossed, it looks like somebody at NASA is thinking along similar lines. Sometimes things take longer than expected. Just look at the Hubble, the James Web, or the ISS. They've all gone way over cost and time. Did we quit? I look forward to SpaceX's future capabilities, but it is just too soon to have no public option. By hook, or by crook, or by congressional order, SLS will be completed. It will serve its purpose while rocketry transitions to the private era. We'll launch at least 2, no doubt. This isn't about quitting, it is about gouging NASA's manned space program to financial death with SLS/Orion. Because nobody can provide a reasonable explanation as to why SLS/Orion are so late and so far over budget, we have to assume there isn't a reasonable explanation. After wasting billions between 2006 and 2011 on related projects, Boeing and company said using proven space shuttle main rocket engines (RS-25) and space shuttle solid fuel rocket boosters would save time and money. So what happened? Orion is a 30% larger Apollo capsule with flat screens. At this point, nobody is impressed by a big 50 year old capsule design with flat screens. In the same time frame Boeing and Lockheed spent ~$30B and counting to achieve nothing, SpaceX has essentially perfected the reusable first stage rocket, successfully launched the Falcon Heavy and developed its Dragon capsule for a relative pittance. SpaceX should be rewarded and Boeing/Lockheed should be investigated. Boeing-- that's all you need to know. If it ever is completed and launched it will most likely take a nose dive. For those who think I am exaggerating the problem with Boeing, take a look at this NASA report. NASA could buy ~24 Falcon Heavy launches per year for the amount it spends on Boeing to accomplish nothing. On page 3 of the report we can see the SLS Block 1, which nobody believes will launch in 2020, is rated to loft 70 metric tons to LEO. The already demonstrated Falcon Heavy can lift 64 metric tons to LEO for $90M to $150M. SLS is costing NASA about $2.2B a year and so far has achieved nothing. Again, SpaceX should be rewarded contracts for launch services and Boeing/Lockheed should be investigated. In addition to Boeing's poor performance, we found a number of unacceptable procurement practices by NASA officials at Marshall that added to contract cost and schedule issues. These practices included not tracking the costs of specific deliverables for each Core Stage and EUS, contracting officers exceeding their warrants, paying significant award fees despite contractor poor performance, and the lack of an approved planfor future Core Stage production. We question nearly$64 million in award fees provided to Boeing since 2012 for the "very good"and "excellent"performance ratings it received while the SLS Program was experiencing substantial cost increases, technical issues, and schedule delays. Without significant corrective action, NASA's efforts to build its first two Core Stages and the EUS will cost significantly more and take considerably longerthan anticipated. Smells like something is very rotten here. Even better now NASA say both loads (Orion+ESM and ICPS) could be launched on a single Falcon Heavy into an elliptical orbit for ICPS to do the rest of EM-1. Sad that it's probably just to scare Boeing into getting back on track.